As early as 8am, security was tight at the plush home of the former Prime Minister Amama Mbabazi along Nyonyi drive in upscale Kololo. This was the venue for Kuhingira (giveaway ) of Bridget Birungi, a niece to Mbabazi and Andile Ramaphosa, son to South African President Cyril Ramaphosa. At mid- day, everyone was asked to move out of the home for a thorough security check. 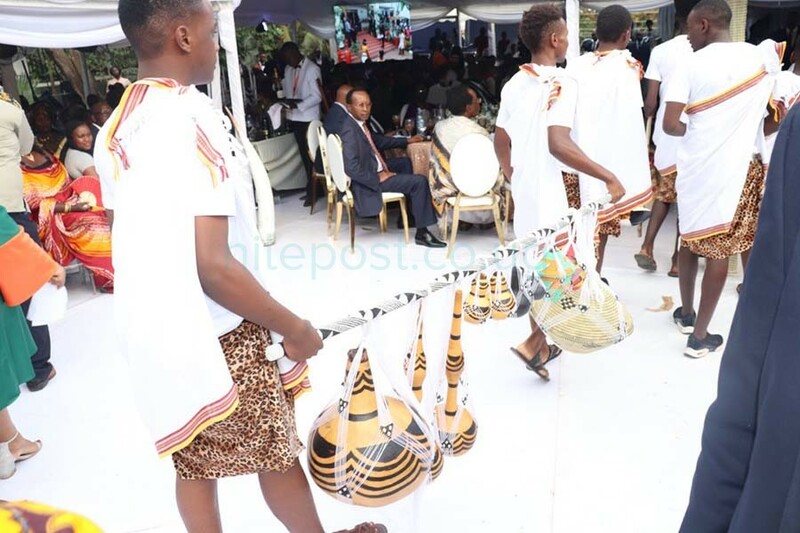 This was done to ensure to avoid taking chances about the security of the guests who included two sitting presidents: Museveni and Ramaphosa. Later, only those accredited including service providers were allowed to access the home after the thorough security check. Inside the home, Special Forces Command (SFC) officers kept busy, pacing up and down and combing the entire area. They turned the tables and chairs upside down and checked the flowers. They took over an incomplete building adjacent to Mbabazi’s house. The Kuhingira was a unification of foes and friends. 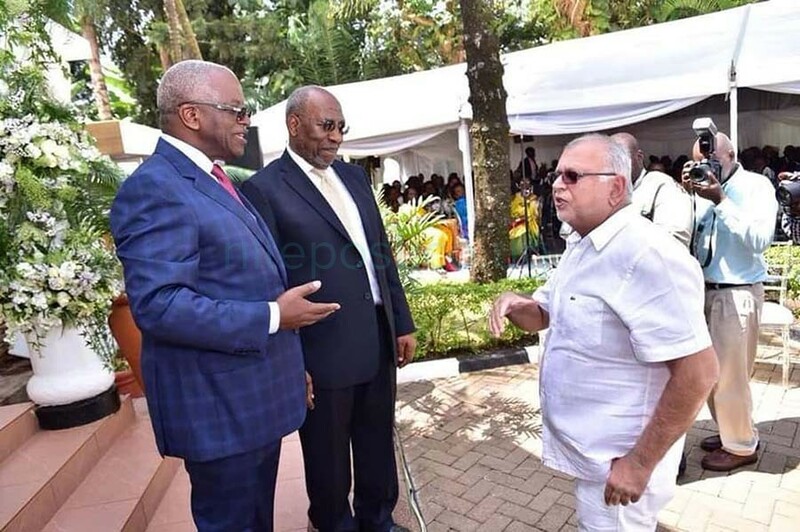 First the presence of Museveni who in 2015 sacked Mbabazi and bitterly fell out with him was significant. Museveni constantly referred to Mbabazi as my young brother. Then Jim Muhwezi, who once accused Mbabazi of witch-hunting him during the 2008 Temangalo land scandal too, made an appearance. Other guests included: Chief Justice Bart Katureebe, Principal judge Yorokamu Bamwine,Ruhakana Rugunda, Charles Peter Mayiga, Emmanuel Tumusiime Mutebire, Gordon Wavamunno and Sudhir Ruparelia. Others were Dr.Martin Aliker, Dr, Johnson Byabashaija, Maj.Gen. Mugisha Muntu, Next Media CEO Kin Kariisa , US ambassador Deborah Malac and Wasswa Birigwa among others. 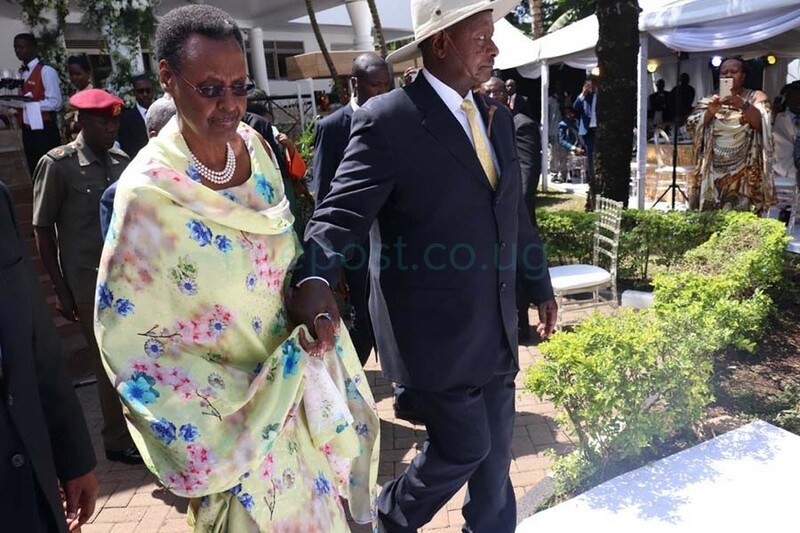 At around 2:30PM, President Museveni and his wife Janet Museveni being chauffeured in a black presidential Mercedes Benz before being welcomed by the hosts, Amama Mbabazi and his wife Jackie and later led to a tent. 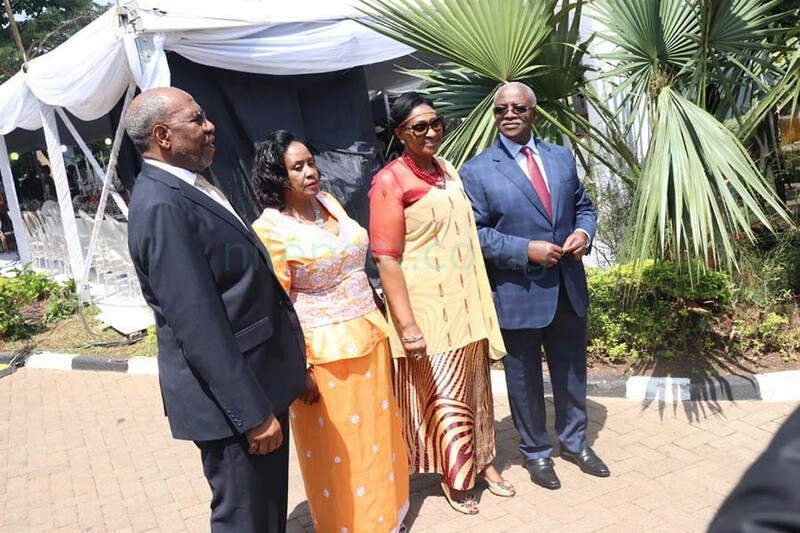 A few minutes later, a delegation of 150 guests from South Africa led by businessman Charles Mbire arrived aboard Uganda Wildlife buses and were ushered into Mbabazi’s home. 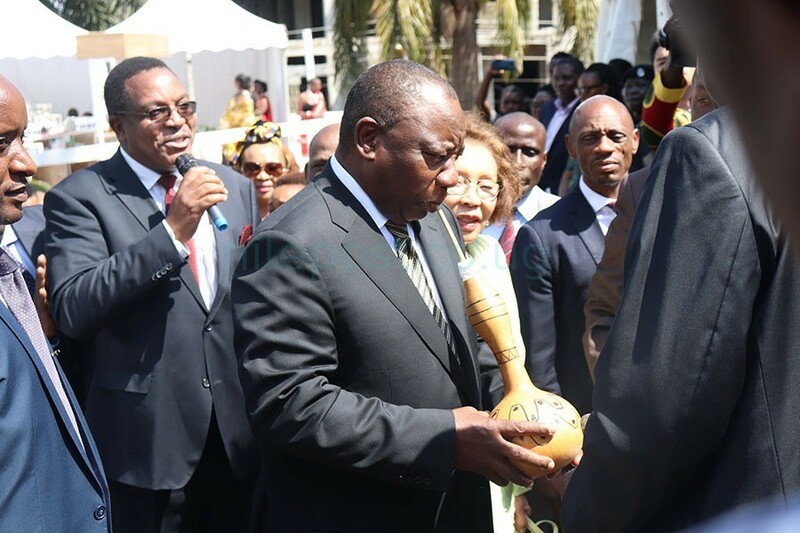 Later, President Ramaphosa also arrived together with his wife before being welcomed by a sip of Bushera, a local brew and ushered into his seat. Guests were served a sumptuous meal that included all kinds of drinks got from an open bar in all corners of the home. As guests ate the meal, they also listened to soothing cultural, and religious both local and South African slow music that went on in the background. The bride, Bridget Birungi and each of the girls escorting her wore Ebishato( skirts and tops), Akahu (a sash with beaded embellishments), Emiringa(traditional anklets) and Obutamasindo ( jeweled forehead band gifts). The bride together with a group of over ten girls was ushered into the tent and the bridegroom’s side was asked to identify her from the group, a thing they positively did. Later, the bride’s aunt handed the bridegroom’s side emihingiro( gifts). These included enkangara, a bag or suitcase in which to carry and keep clothes and engunda Ibiri, calabshes used for storing porridge. One was given to the groom whereas the other went to his father. They were also given ekyitebe kye nkiga, a traditional stool and orugari, a winnowing tray for the preparation of millet and sorghum. The groom’s family was also given entemere mpang’ ibiri, woven baskets used by the bride to carry sorghum in order to make flour and Obwibo which are small woven baskets for the same purpose. The groom’s family was also handed engemeko, a small pot used for boiling water for the husband and rukomyo, a small pot for burning essence so that the bride always smells pleasant. The family was also handed ebikyeka which are mats made traditionally to be slept on. “My daughter, I wish you all the best in your marriage,” the bride’s aunt said as she handed her over to the husband. 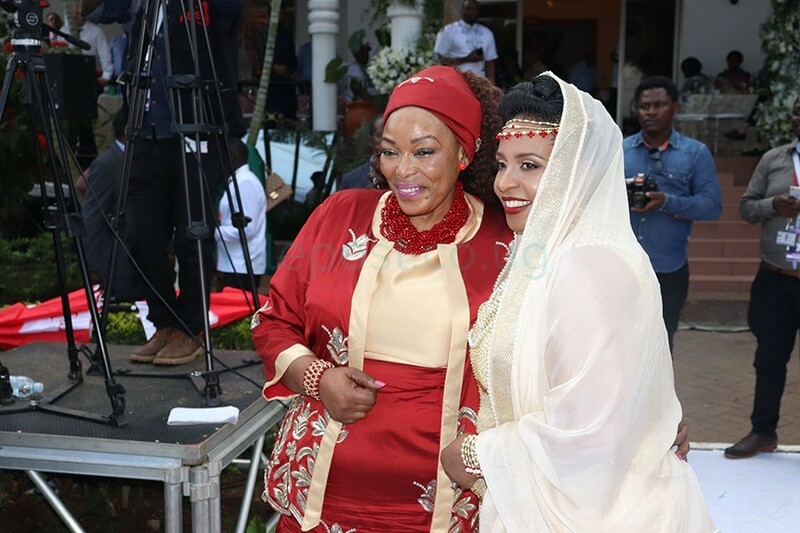 Meanwhile, the bride’s family led by Amama Mbabazi, his wife Jacqueline was joined by President Museveni and his wife Janet who stood up before handing her over the bride to Ramaphosa’s family. 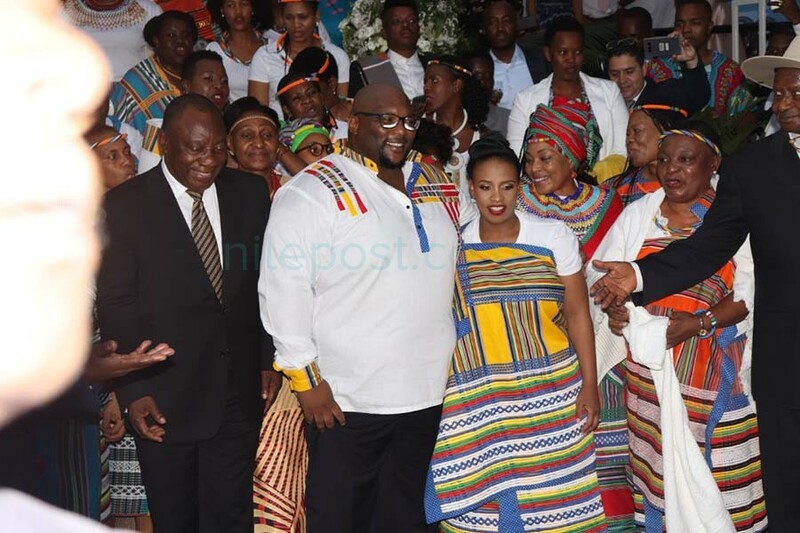 Speaking as he handed over the bride to her groom, Mbabazi applauded Ramaphosa’s family for fulfilling their promise, adding that they deserved to take her daughter. President Ramaphosa applauded the family for bringing up a cool, composed, wise and hardworking lady adding that she is the most beautiful lady in Uganda. 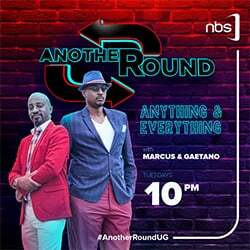 “She is the most beautiful girl in Uganda we have ever seen. We didn’t have to go to Lake Victoria but caught the biggest fish there could ever be,”Ramaphosa said.